Lately I decided to do some storage upgrade on my computer, so after some research I decided to go with a Western Digital 1.5TB HDD. The model I got is the new Western Digital Caviar Green WD15EARS with 64MB of cache and a SATA 2 interface. The disk makes use of Intellipower, which varies the rotational speed between 5400RPM and 7200RPM. The disk has 500GB platters and it employs a technology called Advanced Format, which is essentially the use of 4K sectors instead of 512B sectors used on older drives. On my computer I already had 4 hard drives installed and 2 optical all of them SATA. At this moment i run into the first of the issues with my storage upgrade. The motherboard I own is a Gigabyte GA-EP35-DS3(rev. 2.1) which has 6 SATA II ports onboard, 4 of them on the southbridge and 2 on the JMicron controller. So installing the new hard drive meant that I had to remove one of the drives installed. I decided to remove one of the optical drives, a Sony DVD-ROM, I only kept my DVD-RW since I rarely use an optical drive lately and there is no need for a second. 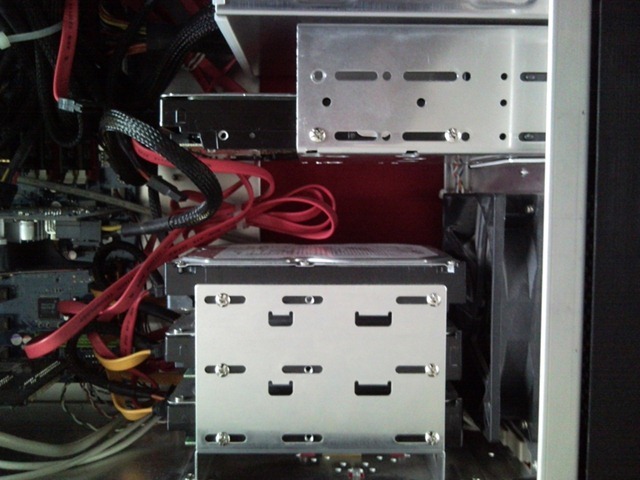 After the removal of the DVD-Rom the internal of my Lian Li case was like this. 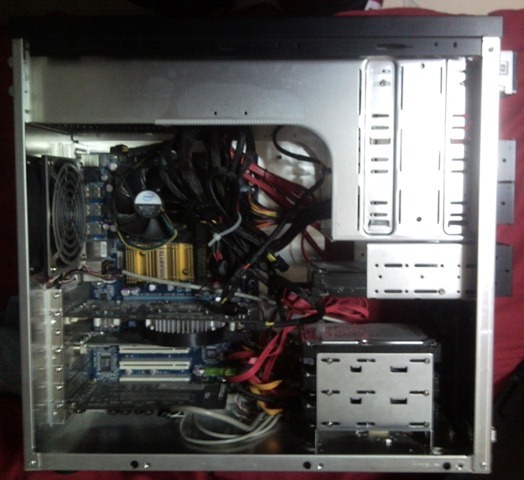 The case has internally 3×3.5” hard drive bays, 2×3.5” floppy bays, and externally 4×5.25” bays. Since I had already 3 drives installed in the HDD bays, I had my 4th drive a 300GB SATA I Western Digital (my music storage) installed in one of the floppy bays. At the beginning I thought of installing the new drive in the remaining floppy bay, but unfortunately I realized that the PCB of the upper drive was in contact with the disk bellow, and I decided to remove the 300GB drive to avoid overheating issues. In the meanwhile I tried to order a HDD expansion module. On of those that convert some of the external 5.25” ports to internal 3.5” HDD ports and also have a fan for cooling the drives. Unfortunately the local Lian Li retailer has only silver colored ones, and my case is black. For that reason I had to go with a black one by Coolermaster the STB-3T4-E3-GP. I ordered one through the retailers website with the option to go and get it from the shop myself. It seems that I was really unlucky because they run out of stock. And my order was cancelled. I will try to reorder as soon as they restock. 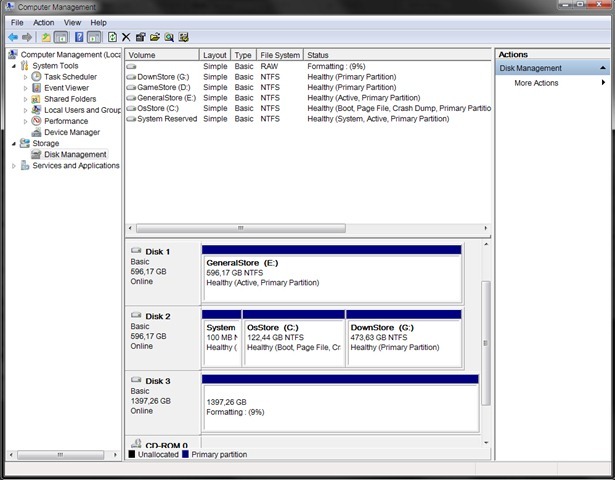 As a temporary solution I decided to move my 300GB disk to my secondary computer, and access the data through the LAN. After finishing with the mounting and connecting the drive I had to format it. As a rule every time I get a new HDD I fully format it in order to check for bad sectors and stuff that wouldn’t appear if I quick format the drive. The format process duration was about 5 hours and 30 minutes, but in completed without a single issue. The drive seems to work fine. The other 3 drives on the computer are 2 WD Caviar Blue 640GB, and one 500GB Seagate 7200.11 with updated firmware. First I got myself 2 500GB 7200.11 Seagate but the first one was off after a few months of usage. The disk was used as a system disk and got full of bad sectors. The other one seems to work up to this point with out any issue. A friend of mine had to change 2 of them, the first locked due to the firmware bug and the second failed like mine. That was the point I stopped getting Seagate drives. Still got two old Seagate drives a 20GB and an 80GB that still work. The 80GB has about two and half years uptime, and I am not really sure about the 20GB (back then the computer didn’t work 24/7) but still the can’t beat my 200GB WD with it’s four and half years of uptime.